Time for England! - Hunter in England! Hello Everyone! The high was 25 F today! Prague is beautiful, but I am not built for winters here! Dr Novotny has been awesome, however, I feel I have overstayed my welcome. Unfortunately, things have not been going well on the publishing of the Far Forest Scrolls via traditional means. I am looking into making arrangements to head home to S. Cal. I am looking forward to sunshine and palm trees. It is supposed to snow this weekend. I have been working on the website for Far Forest Scrolls and it is coming together nicely. Hopefully, I will finish it up soon. The scrolls have been taken the Národní muzeum, or National Museum here in Prague. The museum is awesome! The scrolls are in the Historical Section of this amazing museum. It reminds me of the White House, but with really cool architecture. It is incredibly ornate and unbelievably cool. Yeah Dr. Novotny! The good news, we are finally finished with the translation!!! The bad news, no one, and I mean no one is interested in publishing these great stories! I can't believe all the negative responses we have received from universities, institutions, and private publishing companies. This is a great trilogy that just keeps getting better, book by book. Dr. Novotny is an absolute genius and he keeps pointing out all the great references in there, from Plato, to Greek and Roman times, to buddhism. I thought I would include a few of the nicer images from the cluster of scrolls. 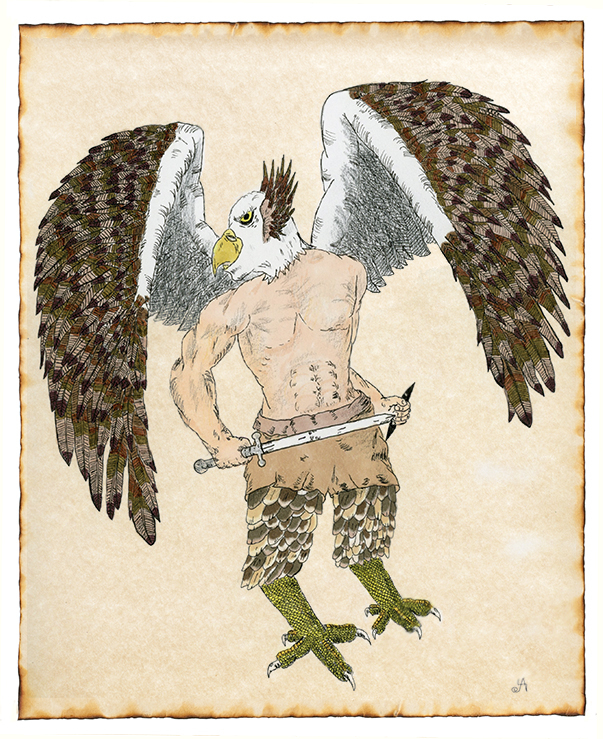 The first is an Eaglian, half-man, half-eagle. p.s. Matus (RC's son) is coming and going to help us send out more feelers to publishers. Great family!!! 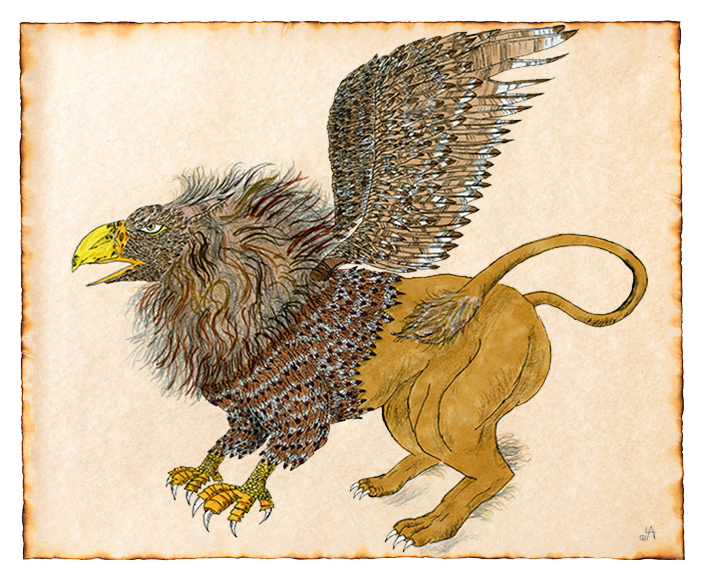 Above is a variation of a hippogriff (a mythological creature dating back to the Ancient Greeks). 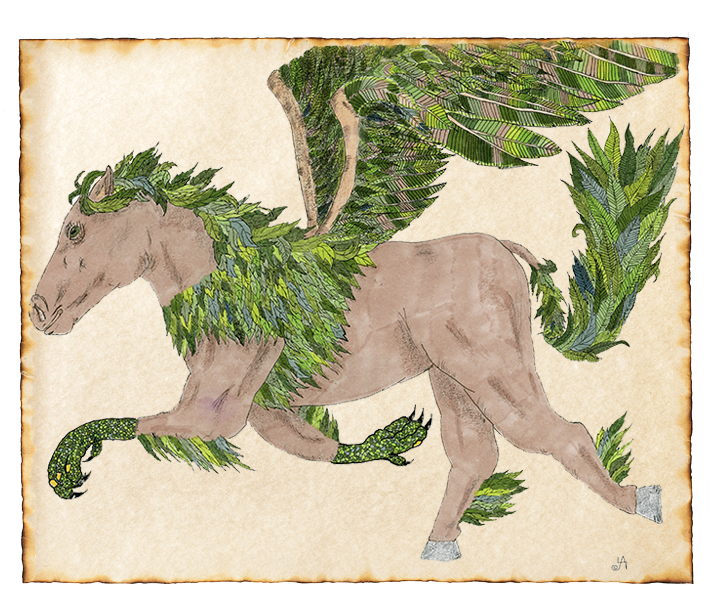 Here we have a hippogriff, another variation on an Ancient Greek myth). Want to see more pictures and find out more about the trilogy? Click on the link directly below. RC (Dr Novotny) is an absolute machine. The guy never sleeps. He takes breaks for tea and kolache and to play guitar (he is sick on it by the way). I had heard him sing once, but never heard him play his guitar. He apparently was also in a band for quite awhile as well. Anyway, we are flying through the translation-when I say we, I basically mean Dr Novotny. We found a stash of well preserved illustrations as well. They are simply in amazing condition. He is helping me put out feelers for publishing and museum placement. However, we are hitting brick walls at every turn. The British Archeological Society has totally ostracized me and this work. I am simply dumbfounded. I feel bad that RC is giving up his holiday to help me, but he seems to be loving every second of it. He had just finished a sabbatical at Charles U. here in Prague so has all his time to help me. We have discovered that the scrolls are filled with a story. We are half-way done and seems to be one contiguous story. Not sure if there are others, or just one long story. So far the story is just getting going at the halfway point. Lots of cool characters, but we know there is a lot more excitement to come because the illustrations are outrageously cool (lots of amazing creatures). I can't believe we are having trouble finding some sort of publisher to take this. Coquelles through: Cologne, Frankfurt, and Nurenberg, to Prague! This is a picture of Old Town Square in Prague. I ended up driving Dr Novotny's car. I thought he would sleep during the ten hour drive from the tunnel exit in France (Coquelles) to Prague, but he didn't, we talked the entire time! He even looked at a few of the scrolls. At the end of the trip he agreed to help me translate them and get them published. He is so awesome!!! He has even agreed to let me sleep on the floor of his little apartment. Prague is sooo amazing. I can't believe it. Not sure where to go from here, other than to say we will translate the scrolls and see what happens. If this doesn't work out, I will be flipping burgers in Boise, I am so glad the last seven years of my life have been so worth it! Today I took the train from Euston to Folkstone. It cost just under forty pounds (£s) and was only an hour and fifteen minutes or so trip. Once in Folkstone I talked to some locals who recommended I get to Stop 24 at J11. This is a spot just before the exit to the Channel Tunnel from England to France. I waited about an hour before someone finally agreed to let me hitch a ride in their car across the channel. I chipped in ten pounds of the 47 it cost them for a round trip to France and back. 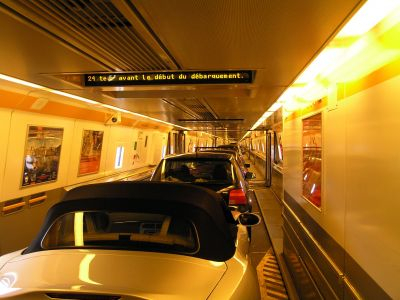 In case you don't know, the channel tunnel is per car (doesn't matter how many people are in it). Now that I am writing this, not sure what I did was legal? The family that took me across in their car was super nice, they emailed me this picture of the tunnel. I should have had them take a picture of me and them together! Can't believe I didn't think of it. The time flew by. It only took about thirty to thirty-five minutes to cross. They dropped me at a Shell petrol station on the French side and Dr. Novotny showed up about two hours later. Poor guy, after wearing the same clothes for so long, I am ripe! I think I am going to get out of here today. Thanks to you guys for your ideas and help. Tif, I appreciate you calling the US consulate for me. I potentially have one of the greatest discoveries of our time and they are treating me like a criminal instead of a victim. They aren't even looking for Weber!!! The British Archeological Society is convinced these scrolls are fake because Dr. Weber hadn't told them about their discovery. Yeah, he is totally sane and trustworthy, not! Aren't they the ones who kicked him out of the country? I even let them review them scrolls. They have already confiscated the three boxes the scrolls came in, but could apparently care less about the scrolls. On a darker note they have searched everywhere!!! Every inch of my person and every scrap of clothing I own. They even had me x-rayed to make sure I hadn't swallowed a coin or something. They told me in all seriousness that I will never work in archeology again?! Apparently, I orchestrated this whole thing-digging without proper permits and then they apparently think I have the ability to forge Old English and Norse text on the great supply of 1000 year old scrolls I carried into the country! Then, because I am fiendish, I threw these forgeries into the three chests I illegally dug up at the site to fool their country! Ridiculous. I am hitching a ride to the Kidderminster train station with someone I met at a "full english fry-up" aka breakfast. There is a train leaving for Birmingham today 6:55pm. I am planning to be on it and going to try and get to London. After three hours in their interrogation room, I was told to stay in town. They later came and got me again after they found some "suspicious mounds" where our camp had been. However, Dr Weber was gone! Apparently, not only had he left, but all of his stuff and our equipment was gone as well. His shed was completely empty. I promised to stay here at the local inn, but they are treating me like a criminal. I called the US consulate today in London. +44 20 7499 9000 I want you guys to have it as well. The second time I went back three people from the Council for British Archeology were there. They were accusing me of digging illegally and trying to "steal" their national property! What? They are acting like Dr Weber was never there, like I masterminded this whole thing! How did I get into this mess? I did it. I am currently at the Royal Forester Inn in Callow Hill. The good news, I was able to acquire all three trunks full of scrolls! I managed to get out of the Far Forest before Dr Weber got back. I hitched a ride to the West Mercia Constabulary. First, they acted like I was crazy, that there was no way we made a major discover there? Next, they acted like I was apart of some elaborate scheme to steal artifacts from England. Eventually, they contacted the Council for British Archaeology and they told the coppers our dig site had been excavated and all "relevant artifacts had been recovered." When the constables told the CBA about the chests and scrolls they were skeptical. They were instructed to take the chests but not the scrolls. I freely handed over the three boxes with the Viking Runes. In order to do so I carefully condensed the scrolls into two large hard case suitcases. The bad news, to make room for them I had to toss my other clothes, so I now have only the clothes on my back.